We are sad to pass on the news that Brady Chex passed away this past week. Brady Chex was a outstanding stallion in both the show arena and breeding. 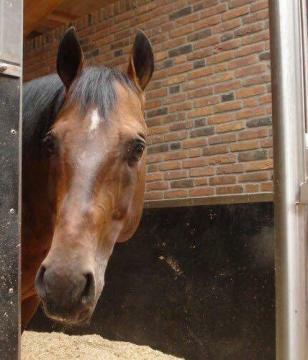 Having had a very successful show career with Rieky: he was on his way to a great partnership with Lot van Zwol showing the makings of a top pairing for the future. A unfortunate injury occurred and after treatment the decision was made to put him to rest. Our condolences go out to the Lot and the rest of the van Zwol family. He will be missed by all that had the opportunity to be around him. But his legacy will live on. May the grass be belly high and the sun always on your back my friend. It is with a sad heart we have to announce the passing of Dunnys Remenic aka “Tiny” as he was known to everyone. Seems like yesterday we seen him as a 2 year old in Texas and brought him over to Europe for fam. Meijer. We have had the privilege to not only train and show “Tiny” but to be with him the past 19 years as his caretaker (maybe he was ours). Tiny’s show record speaks for itsself but that is not the only place he was a Champion. He showed his character and talent with whoever was riding him and made sure they had the ride. He was a true ambassador for the American Quarter Horse and Western Riding. He was a true teacher to many whom graced a saddle on his back it did not matter if you were a young child, adult, teenage girl, a olympic gold medalist, million dollar rider, singer, actor, race car driver, a assistant trainer, royalty or a para rider. He was always there for them, never taking a unsafe step and always giving his rider confidence and courage. We have watched him give first rides in the round pen, first trips in the show pen, demonstrations. He had a ability to always show style and finesse in the reining pen and courage and heart in the cow pen. He never said no and was always there for you.